The Cherry Creek run of the Tuolumne has a number of big class 5 drops and many class 4+ and 5- rapids to keep first timers intimidated and old timers coming back. The riverside scenery is excellent with lots of small granite cliffs and giant boulders along the river. The forest is a mixture of pines and oak woodlands. Beware that there is also plenty of poison oak. Near the end of the summer there is an annual but informal Cherry Creek downriver race and party. Spectators and safety volunteers spread out along the race section and hotshots paddle as fast as they can down a section containing some of the major rapids. Dates for the race are usually announced on Boof.com and other kayaking websites and email lists. Put in: Holm Powerhouse google map. Boaters usually gather up off the main highway at Casa Loma to carpool and coordinate shuttles. Take out: Lumsden Bridge is the first possible take out and the most commonly used one. google map. Boaters can also continue downstream to Meral's Pool by Lumsden Campground. Good rapid by rapid video of Cherry Creek on you tube. Anyone know the water level on that video? Its a great tool for a fun overview of the river. Cherry Creek is considered unrunnable at high water levels. Do not attempt Cherry Creek above 2000 cfs. During higher flow levels, Cherry Creek should only be attempted by individuals with extensive Class V experience and the highest whitewater skill-set. Commercial rafting begins in early-mid July when flows decrease to approximately 1100-1400 cfs. At this level, Cherry Creek is a steep, rushing torrent of non-stop Class IV-V+ Rapids. Commercial rafting continues into late summer and ends when flows decrease below approximately 700-800 cfs. Holm Powerhouse releases dependable flows into the river for much of the summer. 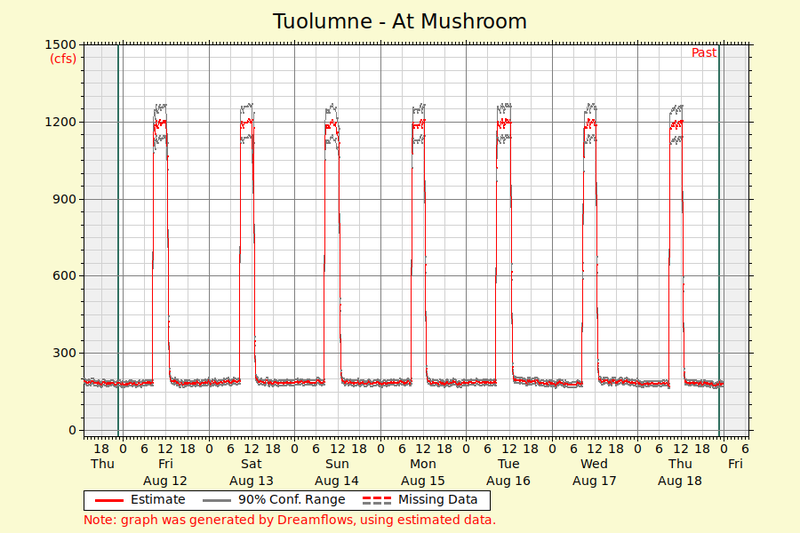 If no graph appears above see Dreamflows estimate of flow at Mushroom rapid. For the planned annual release schedule visit the Dreamflows.com Tuolumne Release Schedule Page.